In the last two decades, various states from the Global South have emerged as important players in international relations. Most popular among them is China. Brazil, India and South Africa have also taken essential roles in global and regional politics. Compared to traditional great powers, they can be labelled ’regional great powers’ or ’regional powers’ because their influence is - with the exception of China - concentrated on their neighbourhood. The impact of regions, meaning the impact of geography, on the economics and politics of regional powers is surprisingly understudied. 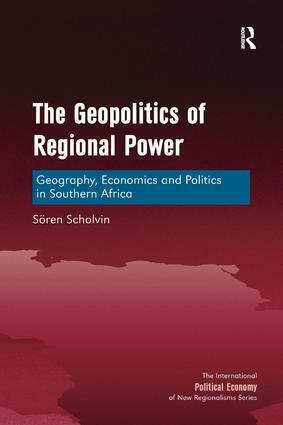 This book analyses how geographical conditions influence the regional economics and politics of South Africa, allowing the author to delineate its region of influence. SÃ¶ren Scholvin (PhD, University of Hamburg) is a research fellow at the Institute of Economic and Cultural Geography at Leibniz UniversitÃ¤t Hannover, Germany. He is also an associated researcher at the GIGA Institute of African Affairs, Hamburg. His research interests are the geopolitics/geoeconomics of Brazil and South Africa, the energy policy of emerging economies, regional economic integration in sub-Saharan Africa, and South American and sub-Saharan African global cities as nodes in regional and global commodity chains.